Continue reading "Virginia plays good offense too (And they’re getting better.)" I would never say Jeff Capel drops bags. https://www.podbean.com/media/share/pb-fxhmy-8454a9 Today I talk about the Week in Review, the Zion Williamson shocker (wink wink, nudge nudge), Miami's probelms on offense and ACC schdeuling along with the Free Agent Market, Injury report, Stock Watch and a quick look at todays 3 game slate. ACC Power Rankings 1/19/18: A week that finally made sense. "this program is currently on fire and no one seems to be pulling the alarm." Continue reading "Louisville is putting it together. NC State has a “must win”. Can GT make it 4 in a row? Clemson goes 0-58"
Miami continues to be Matt Damon. Continue reading "Miami continues to be Matt Damon." What is wrong with Syracuse? https://www.podbean.com/media/share/pb-mawve-836175 Today I give the Weekly Rundown of results. 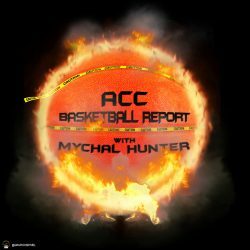 I talk about what is going on with Syracuse, Tony Bennett's "lack of recruiting skills" along with the Free Agent Marketplace and the Injury Report. ACC Power Rankings 1/12/18: A new #1 and then it’s kind of a mess. Continue reading "ACC Power Rankings 1/12/18: A new #1 and then it’s kind of a mess." The home teams fall flat. Duke and VT right their ships. Clemson hits the road tonight. Continue reading "The home teams fall flat. Duke and VT right their ships. Clemson hits the road tonight." Continue reading "Virginia continues to roll while UNC makes a statement. 8 teams in action tonight"
https://www.podbean.com/media/share/pb-8z7n7-8278d6 On this weeks episode I discuss the Bonzie Colson and Matt Farrell injuries and how they impact Notre Dame. Syracuse being a disappointment after they convinced me to buy in. Jordan Tuckers transfer and how we all saw it coming. Zion Williamson watch. The weekly review and stock watch.